Many family members feel helpless in the face of addiction. Watching someone you love harm themselves with drugs or alcohol can be incredibly painful, as can watching a loved one’s addiction negatively impact your children, parents, or partner. Getting your loved one into treatment is probably your goal, but how can you help an addict or alcoholic family member choose to enter rehab? Keep reading to learn how you can support your family member in their recovery. 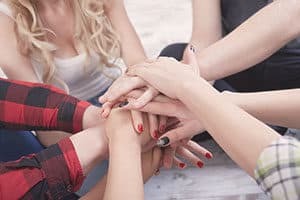 Learning about addiction can be an important first step toward helping you better understand what your family member is going through, but perhaps more importantly, it may prepare you for the road ahead. Depending on your family structure and your relationship to the addicted person, you may have different questions, such as, “How do I know if my loved one is really addicted?” Fortunately, there are many resources that outline the signs and symptoms of drug and alcohol addiction. The National Institute on Drug Abuse (NIDA) is an excellent educational resource that provides information about the science of addiction, including why it is so difficult for some people to stop using on their own. You can learn how drug and alcohol abuse causes changes in the brain, as well as what cutting-edge treatment models are used. Al-Anon and Nar-Anon are two other resources that can be helpful to those who have alcoholic or drug-addicted family members. These organizations run groups that offer emotional support from people who are in situations like your own. You can also learn from long-time members who have been where you are now about how to cope with what your family is going through. These groups are free to attend and open to everyone. Learning as much as you can about possible treatment options can help you feel more confident about talking with your loved one. You can get ahead of the game by researching how treatment programs differ, what they specialize in, how much they cost, and what your family member’s insurance plan will cover. All substance abuse programs involve some type of behavioral therapy or counseling, but some specialize in co-occurring disorders as well, which is the presence of both a drug or alcohol addiction and a mental health disorder (like depression or anxiety). One reason this might be true is that people with depression, anxiety, or PTSD sometimes turn to drugs and alcohol to self-medicate their symptoms. Drinking and drug use may temporarily relieve symptoms of their mental health problem, but over time, they can actually make the condition worse. It’s especially important to find competent dual diagnosis treatment since simply treating one condition without treating the other is often ineffective in the long term. Locating an experienced treatment professional to perform a comprehensive assessment is a good first step in helping your loved one get the help they need. If the substance abuser is your co-parent, you may have subconsciously taken on all of the parental responsibilities—including housework, transportation, and income generation. If you are the parent of a teenager or a young adult with addiction, then you may have changed your behavior toward your child, for example, tiptoeing around the house to avoid conflict or no longer expecting good grades. Sometimes, for an addict to get sober, the whole family needs to make changes. This could include adjusting responsibilities, attitudes, expectations, finances, and communication.2 Additionally, the impact of addiction usually stretches beyond the immediate family unit and often includes extended family, neighbors, coworkers, and friends. Friends and family are frequently asked for financial assistance or housing, and coworkers carry a disproportionate amount of the workload. Car or car insurance payments. Tell them they can earn back privileges if they go to treatment (provide incentives). Don’t let them drive your car. Don’t tolerate excuses, and don’t make excuses for them (e.g., “He had a bad week”). Stop saving your loved one when they get in trouble; allow them to experience the natural consequences of their actions. Don’t bail them out if they are arrested. Don’t give them more of their substance of choice when they are in withdrawal because it’s hard for you to watch them suffer. Set healthy boundaries and limits (e.g., no alcohol or drug use in the house). Talk to your extended network of family and friends and tell them not to provide assistance. Make notes before your talk and use them. Talk to the person when they are sober. Avoid labels like “drunk” or “junkie”. Talk someplace private and quiet. Remain calm and speak in a nonjudgmental way. List specific instances when you were concerned (e.g., when they drove drunk last week). Start sentences with “I” (“I felt scared when…” “I felt hurt when…”) instead of “you” (“You get so angry…” “You didn’t show up…”) to explain how the person’s behavior is impacting you without putting them on the defensive. Prepare yourself for denial, anger, and resentment. Show that you are optimistic and hopeful for change. Understand that addiction is a chronic, relapsing disease, and stay positive. Manage your expectations; this may be only the first of many conversations. Alternatively, you could say, “Did you know that more than 28 people die every day in the U.S. from drunk driving crashes? I’m worried that you will hurt yourself or someone else.”4 This is a less confrontational way to say the same thing and, as such, may have a higher chance of effecting change. If you have a family member with an addiction, then you know how all-consuming it can be. It is not uncommon to feel frustrated, hopeless, and exhausted from dealing with their problems. Repeated trips to rehab can try your patience and deplete your finances. You may feel like giving up—like taking the path of least resistance and continuing to enable—and that is why it is so important to take care of yourself. When you take care of yourself emotionally, spiritually, and physically, then you have more internal resources to help your loved one. Reach out to your friends and family for support. See a therapist once a week to talk about your own feelings and struggles. Find an activity that gives you time alone to relax, such as meditation, running, walking, yoga, or biking. Eat regular, healthy, nutritious meals. Don’t ignore any medical problems you may have. Attend a local support group for family members of alcoholics and drug addicts, such as Al-Anon or Nar-Anon. Substance Abuse and Mental Health Services Administration, Center for Behavioral Health Statistics and Quality. (2016). Key Substance Use and Mental Health Indicators in the United States: Results from the 2015 National Survey on Drug Use and Health. Center for Substance Abuse Treatment. (2004). Substance Abuse Treatment and Family Therapy: Chapter 2: Impact of Substance Abuse on Families. Rockville (MD): Substance Abuse and Mental Health Services Administration. Partnership for Drug-Free Kids. (2014). Helping an Adult Family Member or Friend with a Drug or Alcohol Addiction. Centers for Disease Control and Prevention. (2017). Impaired Driving: Get the Facts. U.S. Department of Health and Human Services. (n.d.). What Is Mental Health?